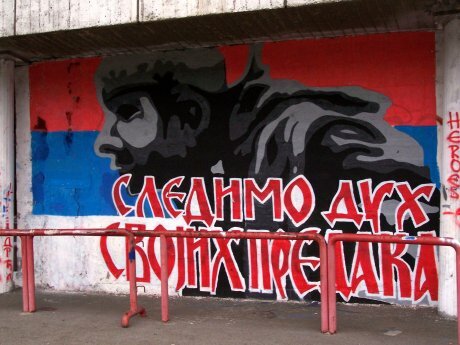 A mural outside the Red Star stadium. Wikimedia commons/Darwinek. Some rights reserved. As Jean-Paul Sartre observed, “In football, everything is complicated by the presence of the opposite team.” Applied to the situation in Yugoslavia at the end of the 1980s, football was very complicated indeed. During that period, football stadia across the country became breeding grounds for nationalist conflicts, especially between football fans from Serbia and Croatia. Yugoslavia, at that point, was facing deep internal crises, economic as well as political, while interethnic tensions between the constituent nations were driving the country further towards what seemed like an inevitable dissolution. Like most of Western Europe during the 1980s, Yugoslavia had serious problems to do with hooliganism and football violence. While in Britain, Margaret Thatcher was cracking down on the so called “slum game played in slum stadiums watched by slum people”, the roots of football related violence in Yugoslavia were of a different nature. Newly formed fan groups, created mostly during that decade, very soon changed their focus from regular football rivalry to national issues. Chants of ethnic hatred echoed around stadia – more incredible if one considers that overt displays of nationalism were a still a crime in Yugoslavia. The stadium became the “national vanguard”, a voice amplifier for nationalist rhetoric, creating a vast space for manipulation within the beautiful game. Things came to a head at the club game between Dynamo Zagreb vs. Red Star Belgrade on 13 May 1990. The venue was Maksimir stadium in Zagreb and the riots began before the match had even kicked off. The game was never finished, and it’s a miracle it was even started. The riots set off a chain of events which heavily influenced the ongoing crisis in Yugoslavia on a political as well as symbolic level. The match between Dynamo and Red Star was played two weeks after the Croatian Democratic Union (HDZ), under the leadership of Franjo Tuđman, won the first free parliamentary elections in Croatia. The HDZ’s ultra-nationalistic program, complementary to that of the successors of the Communist Party under Slobodan Milošević, did not inspire hope for a peaceful solution to the Yugoslav crisis. In this respect, the actions of the two fan groups – Red Star’s Delijes and Dynamo’s Bad Blue Boys – was not the least bit surprising. The war of course did not begin at Maksimir, but the epilogue of this never ended game wasn’t just a massive fight between the supporters and the police, but also some important political machinations, most notably Croatian police evicting the Serbian managerial staff from the stadium. The riots on Maksimir stadium just accelerated the on-going process of disintegration, while football - thanks to the phrase “The war started at Maksimir”, which was coined and heavily exploited immediately after the match - became an inevitable symbolic factor in explanations of the Yugoslav crisis. The consequences of this marriage between football and nationalism weren’t just symbolic. In May 1991, Red Star Belgrade achieved the greatest success in Yugoslav footballing history, by winning the European Champion Clubs' Cup (precursor to the Champions League). This extraordinary success wasn’t perceived only as a huge sporting triumph - the club’s outstanding result was actually seen as an accomplishment of the whole Serbian nation, despite the fact that the Red Star squad represented the whole of Yugoslavia, with its team containing star players from almost every nation of the country. However, the Serbian regime and its ideologists used this success as a way to stoke the flames of ethnic nationalism that were pervading the country. It was even claimed that Red Star, together with the Belgrade daily newspaper Politika and the Serbian Academy of Science and Arts, represents one of so-called “Pillars of Serbhood”. At the same time, and especially after the Maksimir riots, the most extreme parts of Red Star fan group fell under the influence of Željko Ražnatović (Arkan), a notorious criminal later indicted by the International Criminal Court for War Crimes in The Hague. Under Arkan’s command, the Serbian Volunteers Squad was formed, the majority of which came from the Red Star’s Delije group, while a large number of the Croatian football fan groups joined the units of the Croatian army in the making. As noted by Serbian ethnologist Ivan Čolović, in the years before the war football fans from the former Yugoslavia had a sort of premilitary training in the stadia. Soon they would exchange the flags and banners for rifles and bombs. Hence, starting from the end of the 1980s, the stadia across former Yugoslavia served as a vanguard for the forthcoming eruption of ethnic violence. The virtual shift from ritual violence to real and bloody warfare, and the dominant nationalist politics in the states became social actors with strong political influence. When ritual aggression overflowed from the stadia to other social spaces, violence became socially and politically legitimized. The entire social milieu during the 1990s functioned in this key, allowing for the violence and aggression to become normal social behaviour and a legitimate way of achieving political goals. Croatian sociologist Srdjan Vrcan argues that through a specific synergy of the state, para-state and ostensibly reprivatized violence, fan groups were no longer condemned as hooligans. They deserved a new status; one legitimised through alleged patriotism. However, in comparison with similar cases like in neighbouring Croatia, Serbia’s unique development during the 1990s prevented the national football team from playing a major role in national homogenization. The national squad during the 1990s actually played under the name and symbols of Yugoslavia, representing the country constituted only by Serbia and Montenegro, but still keeping the symbols of the former state, like the national anthem and the flag, though without the socialist five-pointed star symbol. The symbolic heritage of the former state wasn’t at all acceptable for the “proven patriots” of the fan groups, hence the games of the national team were massively boycotted. Even if the crowd was present in the stadium, the obligatory part of the ritual was booing the national anthem, or chanting slogans like: “Red Star Serbia, never Yugoslavia!” The only exceptions were matches against the “old foes”, such as a match against Croatia in 1999. After the fall of the Milosevic regime in October 2000, the new Serbian government promoted a politics radically different from the old style, officially distancing themselves from former nationalistic projects. These radical changes, though, didn’t correspond very much with reality, from everyday politics to football. Actually, the opposite happened. Extreme football fans kept their positions unaffected due to their mythic role in overthrowing Milosevic and his regime. According to legend, the real struggle against the Milosevic regime started at the Red Star stadium after massive riots and fights with the police. The “true patriots” now gained a new aura of “revolutionary heroes”, additionally strengthening their legitimacy and authority regarding many political issues, with a special emphasis on topics connected with the question of the so-called “national interest”. Consequently, the new government continued to treat fan groups as a relevant political subject. As a result, a significant number of incidents happened during the first decade of 2000s, starting with political slogans such as “Kosovo is Serbia”, and an open support of those indicted for war crimes, such as Ratko Mladić or Radovan Karadžić, along with open outbursts of ethnic hatred, including banners with slogans such as “Knife, Wire, Srebrenica”. None of these incidents have been prosecuted, nor has there been much of a wider public condemnation. Political legitimacy of football fans and their influence on everyday politics could be seen in the case of the banned Gay Pride Manifestation in 2011, when the government, mainly under the pressure of extreme football fans, decided to cancel the event with the explanation that it was not possible to guarantee the safety to the participants. A similar kind of public discourse can be distinguished in the recent case of Adem Ljajic, a Muslim member of the Serbian national team, whose decision not to sing the national anthem led Serbian coach Sinisa Mihajlovic to ban the player from the squad. Referring to the so-called “cult of the national team”, Mihajlovic has actually perpetuated a well-known mechanism where ethnic and religious identity is seen as equivalent to citizenship. However, a soft reaction from the public, as well as the prevailing condemnation of the coaches’ decision, suggest that this kind of aspiration towards national homogenization doesn’t have the same public support as it used to. Political and cultural elites in Serbia still carefully listen to the messages coming from the stands, whether they get the etiquette of “national traitor” or “true patriot”, and the violence coated with patriotism as a higher goal still represents an instrument of pressure in political struggle. Once released and legitimized, the spirit of ethnic hatred can’t be easily brought back in the bottle. However, the poor state of Serbian football in the neoliberal world, with clubs living on the edge of existence, and the national team without results and support, gives almost no space for any kind of homogenization, national included. If during the 1990s Serbia didn’t have enough bread, but had plenty of games, at this point it seems that the country is left without either.